Wasn't sure if this is the right place to post this kind of stuff, if it isn't please notify me, or move this topic to an appropriate place. 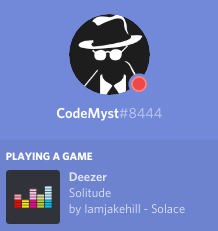 DeezCord is a small app that allows you to display your last played song in Discord as your playing status. Não tem certeza se é um lugar certo para postar esse tipo de coisa, se não é por favor, avise-me ou mova este tópico para um lugar apropriado. DeezCord é um aplicativo que permite a exibição de sua última música não tocada como Discord como seu status de reprodução. o meu não executa como resolver isso? I will need more information to see why it doesn't work. But I think I already know the issue and I will try and fix it over the upcoming days. I will post again when it's done. Sorry for the inconvenience. I don't own a MacOS system so I can't check that one, but the Windows and Ubuntu release are working properly. Logged in to say that you did a really good job! Thank you! is it possible to make it update every song? You did really good job! I hope you'll update it sometime in future and add current song playing on status bar. Deezer and Discord should make your work official and add it as an option on Discord.